1919-1920 [COLLECTIONS] LEGIONAIRE / T. G. Masaryk 1920 research material both issues, ex. Zdeněk RYVOLA, contains reconstruction of plate T. G. Masaryk 1920 values 125h, 500h and 1000h (used), identified single pos. and plate, various plate variety etc.., single pos. often more times; issue Legionaire i.a. with several complete sheets stamp. Lion Breaking its Chains, then reconstruction of plate etc..; all identified and described, in addition supplemented with about/by zápisky, notice and study matter Z. Ryvoly, total 8 creases and large stockbook A4, placed in middle box, lot of study of material! 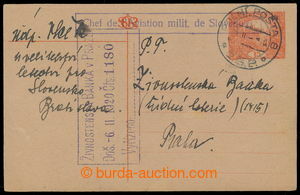 1920 commercial Express letter to Italy with Pof.172 type I + 154, 157, CDS PRAGUE/ 8.II.20, arrival MILAN on reverse; signs of usage., rare occurrence - stamps issue Red Cross 1920 wasn't allowed vyplácet mailing abroad! JAN MRŇÁK - PŘEDNÁŠKA O TESTER S OVERPRINT "POŠTA ČESKOSLOVENSKÁ 1919" / rare collection instruktážního of material dokumentujícího přípravné work on/for přetiscích POŠTA / ČESKOSLOVENSKÁ / 1919, contains i.a. overprint cliché, matrix , odlitek (stereotyp) from matrix etc.., sestaveno and described one from best known Czechosl. experts Janem Mrňákem, supplemented with about/by exhibits overprints (overprint štočky aren't original, only copy with other size) and 9 pages text his přednášky; extraordinary offer, ex. J. Mrňák! 1926 TURKISH OCCUPATION - BEIT UL LAHM (Bethlehem); two Reg postcards with issue Landscape 1914 and overprint stamps, through Jerusalem, Beirut and Istanbul to Prague; Reg cancel, double censorship; perfect quality, rare! 1985-1992 selection of 29 pcs of stamp booklets from daného period, i.a. stamp-booklet 33, 58, 59, 90, 93-94, 100 etc.., 3x Itália 90 etc.. PLATE PROOF value 300h in black color, as miniature sheet, 4th stage, on chalky paper without gum; certificate Vrba and exp. by Karasek, very rare plate proof, only few examples exist! Pof.58bA blank coupon, Rectangle 5h green with bottom unoverprinted coupon, blue Opt, line perforation 12½;, overprint type III. ; mint never hinged, certificates Vrba and Karásek, exp. by Gilbert., cat. 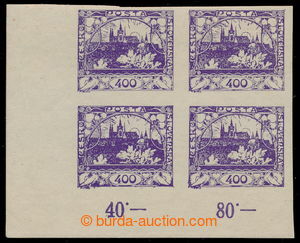 Pofis 40.000CZK, Mercure 50.000CZK, rare stamp in very nice quality! Pof.51axI Pp, Coat of arms 10K dark violet, clear print, INVERTED OVERPRINT, type II. ; hinged, certificate Vrba, exp. by Gilbert., Mrňák, cat. Pofis 25.000CZK, very rare, in catalogue very undevalued! PLATE PROOF DŘEVORYT, Pof.164, joined printing two pcs 100h in/at tete-beche/opposite pozici, in light brown color on stamp paper with gum, MS arrangement - size 102x67mm; two lightly hinged in lower corners, certificates Karasek and Vrba, exp. Vrba, illustrated in Monograph 2, page. 376, cat. Merkur-Revue 50.000CZK, quite rare and rare dřevorytový plate proof! Pof.13aA, 30h dark violet, combined perforation 13¾ : 13½; very fine, mint never hinged, certificates Vrba and Karásek, exp. by Gilbert., Karasek, rare stamp! 1919 Hungarian express p.stat telegram Sürgös Távirat with printed stmp 2f issue 1917 with hnědočerveným overprint "TIZ" (deset) as parallel Czechosl. p.stat, uprated by. tricolor franking stamp. Hradčany 200h ultramarine, 20h blue-green and 10h red, Pof.22, 8, 5 with CDS LIPTÓSZENTMIKLÓSZ 919 Mar.21., (Liptovský St. Nicholas); only several light folds, good condition, very rare to exhaustion- p.stat telegram dekorativně franked with. Hradcany-issue stamps! Pof.79, Small numerals 50h red, BLOCK OF FOUR (!) with joined overprint types, overprint types III+II/ +III+II; superb piece, certificates Vrba and Karásek, exp. by Mrnak and Lešetický, cat. 75.000CZK, scarce multiple! 1918 Pof.NV4Ms(2), Falcon 10h violet, 2-stamps vertical unfolded gutter, very rare distance between stamps 19mm (! ); mint never hinged, lower minor gum fault, otherwise very nice quality, certificates Vrba and Karásek, very scarce, often missing in collections, exists only several pieces, cat. 35.000CZK! Pof.51ayI, Coat of arms 10K dark violet, BLOCK OF FOUR with joined overprint types II+II/ I+I, unclear print, high format; superb multiple, certificates Vrba and Karásek, exp. by Mrnak., cat. 50.000CZK, extremely rare! Pof.71, Large numerals 50h red, BLOCK OF 4 (!) with joined overprint types, overprint types II + I/ III+I; superb mint multiple!, certificates Vrba and Karásek, exp. by Leseticky., cat. Pofis 150.000CZK, Mercure 180.000CZK, very rare! Pof.99, White numerals 10f red, marginal block-of-4 with control-numbers and joined overprint types I. + II./ III+III; superb, certificate Vrba, exp. by Mrnak., cat. Pofis 50.000Kč++, Mercure 60.000Kč++, very rare multiple! 1918 Pof.SK1, Scout stamps 10h blue, joined printing of 4 stamps with definitive margins, horizontal strip; mint never hinged, VF, certificate Vrba, joined printings of scout stamps are very rare! 1933 Pof.274Ms(2), issue Nitra 1Kč red, vertical 2-stamps same facing gutter, marginal piece with PLATE NUMBER 1A; superb mint piece, certificates Vrba and Beneš, catalogue price 800.000CZK by italic; this gutter belongs to the rarest items of Czechoslovakia and is unique, only another one gutter with plate number 1 recorded, great exhibit item! Pof.55, 4 K + 2KN, Triangle 2h brown-red, block of 4 stamps with 4 overprinted and 2 blank coupons (! ); superb multiple, certificates Vrba and Karásek, exp. by Gilbert., Karasek, cat. Pofis 50.000Kč++, Mercure 60.000++, very rare multiple, an exhibit item! Pof.48aII, Coat of arms 2 K dark blue, wide format, overprint type I.; lightly hinged, certificate Vrba, exp. by Gilbert., Fischmeister, cat. 75.000CZK, very scarce stamp! Pof.49aII, Coat of arms 3K dark red, wide format (! ), overprint type I.; repaired gum, light vertical bend, certificate Vrba, cat. Pofis * 180.000CZK, Mercure 200.000Kč, very scarce stamp, still presentable example, missing in most collections! 1948 Pof.A492N, NEVYDANÝ miniature sheet Gottwald 30Kčs in blue color with olivovým background print (type III. ), size 66x99mm; excellent quality, exceedingly rare, quite rare occurrence, known only several little pieces, missing also in/at těch greatest collections CZECHOSLOVAKIA 1945-92.! Pof.65, Large numerals 2h red, overprint type III. ; mint never hinged (! ), fine centered piece, at top small original horiz. bend, certificate Vrba, exp. by Mrnak., Lešetický, cat. Pofis 150.000Kč, Mercure 140.000Kč, very rare stamp! Pof.52I Pp, AIRMAIL with overprint FLUGPOST 1,50K/2K violet / black, HIGH FORMAT, overprint type I., INVERTED OVERPRINT (! ); superb piece with full original mint gum, only this unique example known, certificate Vrba 2017, Karásek and Pittermann, exp. by Gilbert., Pittermann, Kaufmann, Lešetický; cat. Pofis also Mercure -,-, by our estimation at least 2.000.0000Kč, one of the rarest Czechoslovak stamp!, extremely scarce! 1948 Pof.A492N, NEVYDANÝ miniature sheet Gottwald 30Kčs in/at ČERVENÉ BARVĚ with olivovým background print (type III. ), size 66x99mm, miniature sheet was/were in/at definitive the shape of tištěn in colour carmine without background print; superb, still single known piece - unique rarity, at all first-time offered in/at jakékoliv auction, exceedingly rare, quite rare offer with investičním potenciálem! 1862 SG.122, 4C blue, local issue of postage stamp (Royal Gazette Georgetown), in the middle typical signature of Georgetown Postmaster Robert Mather; very fine, rich color, issued without gum, exp. Herbert Bloch, cat. £6.000, rare stamp! 1850 Ferch.5IIIa HP, 9 Kreuzer IIIa, scarce GESTREIFTES PAPIER (laid paper), round CDS PRAG KLEINS; full to wide margins, small smoothed horiz. fold, otherwise very nice quality, certificates Matl and Diena, exp. Ferchenbauer, cat. Ferchenbauer 18.500€; very rare stamp, known only several pieces, rare offer! Pof.37 ST A+B+C+D, Crown 12h green-blue, complete sheet of 100 stamps with scarce joined overprint subtypes of numeral "9", plate 2, pos. 50 subtype IIa, pos. 60 subtype Ia, pos. 90 and 100 subtypes IIa; very fine, centered overprint on all positions sheet, cross fold, in margins of horiz. perf slightly underlaid (i.a. pos. 50 and 60), certificate Vrba + Karásek, exp. by Karasek., Vrba, cat. only for joined types IIa+Ia * / IIa+IIa ** cat. Pofis 250.000CZK, cat. Merkur-Revue 380.000CZK, of of the greatest multiple, unique, extremely scarce! Pof.56, Triangle 5h green, horizontal strip of 3 (! ), joined Opt types II+I+II; superb mint piece, certificates Vrba and Karásek, exp. by Mrnak., scarce multiple! Pof.52I, AIRMAIL with overprint FLUGPOST 1,50K/2K violet / black, HIGH FORMAT, overprint type I.; very fine piece, lightly hinged; certificate Vrba, exp. by Karasek., Mahr, cat. Pofis 300.000CZK, Mercure 350.000CZK, undervalued, great rarity! Pof.51b I, Coat of arms 10K light violet, GRANITE PAPER, high format (! ), overprint type II. ; repaired gum and perforation on the right, certificate Vrba 2017, also certificate Karásek and Pittermann, one of rarest stamps of CZECHOSLOVAKIA 1918-1939, still great genuine (!) example, cat. Pofis 1.000.000CZK, Mercure 1.600.000CZK, only 14 examples recorded, extremely rare! Pof.129Px, Black numerals 12f green / black, combined perforation 15, wmk Px - leftwards, overprint type IV. ; very nice piece with mint original gum, certificate Vrba and Gilbert, exp. by Mrnak., cat. 200.000Kč (! ), very rare stamp! UNISSUED / Black numerals 20f green / black, BLOCK OF 4 (! ), combined perforation 15, wmk - y to the right, overprint types II + IV/ I + I; mint never hinged without hinge, over two stamps vertical bend, certificate Vrba, exp. by Leseticky., decorative multiple, as block-of-4 very rare! Pof.154B ST, horizontal pair of Chainbreaker 40h brown with joined types of leaves, on pos. 96/1 type II - 10 leaves, line perforation 13¾ (! ), CDS VÍTKOVICE NA MORAVĚ. 4.IV.22; nice quality, certificates Vrba and Karásek, cat. Merkur-Revue 150.000CZK, very rare joined types, known only few examples, item for largest exhibits! 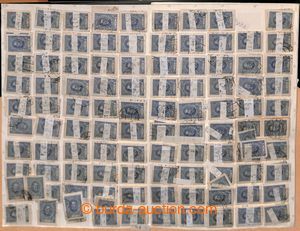 1840 SG.1, horizontal strip of 6 (!) PENNY BLACK, plate 5, letters MA-MF, black Maltese cross; in the middle original paper crease, right stamp cut to the margin, otherwise full margins and also fine quality; rare multiple! 1872-1875 SG.20, Victoria 1Sh violet - pink, unused highest value with typical irregular perf; very nice piece with part of original gum and certificate RPSL, cat. £5.500, very rare stamp, first-time on offer! 1918 commercial money letter for 300.000K (!) franked with 10x Coat of arms 10K, light violet, wide format (!) + 2x Coat of arms 1 K + 1x Charles 20h, CDS PRAGUE 5 / 9.XII.18; on reverse in the middle well preserved seal, overall very good condition, certificate and exp. Vrba, extremely rare entire, definetely exhibit item!